West Ilsley in period of great prosperity with great hope for the coming months. 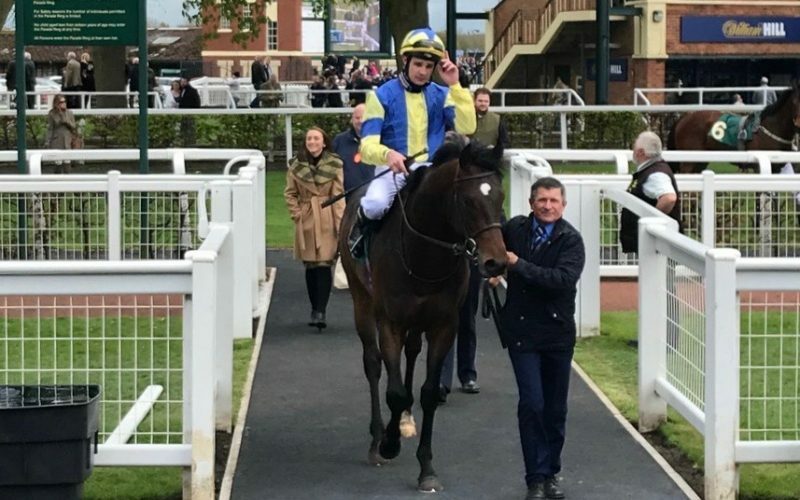 Before dominating the card at Salisbury on the Sunday, on Saturday 28th April there was a winner in the north as Sixties Icon proved yet again that he’s a sire of true value. 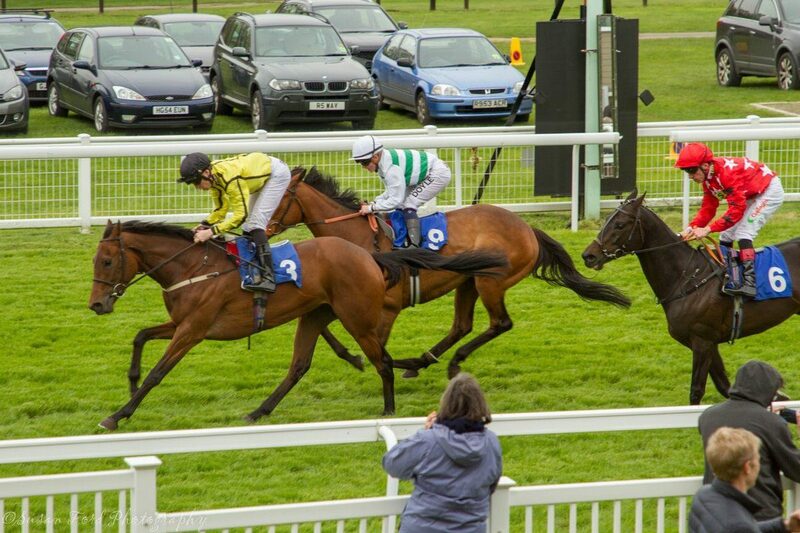 David Hudd, Chris Wright & Ann Black’s KINKS was most definitely not like everybody else as he and Charlie Bishop powered home in the five furlong novice auction stakes by over two lengths ahead of Brocklesby second Broken Spear with the rest a long way in arrears. 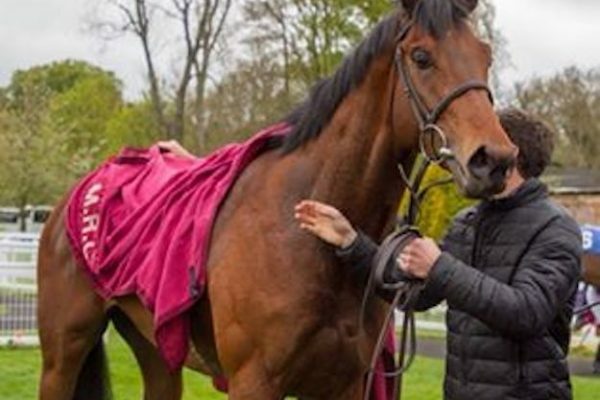 The son of Sixties Icon & resident Norman Court Stud mare Crazee Diamond was shouldering a six pound penalty for his previous victory at Bath only a week ago but he showed that he’s above average and trainer Mick Channon couldn’t be happier as he plans his next steps and a tilt at black type. “An absolute smasher whose dam had a Swiss Spirit filly on the same day funnily enough. He is a star and has the looks and attitude that has got us all a bit excited with Royal Ascot creeping into everyone’s mind. KINKS: A first foal; Crazee Diamond the dam was a 6f AW winner (RPR 70), closely related to Listed-placed 5f winner Thesme out of 5f winning half-sister to 5f 2yo Group 3 winner Castelletto. 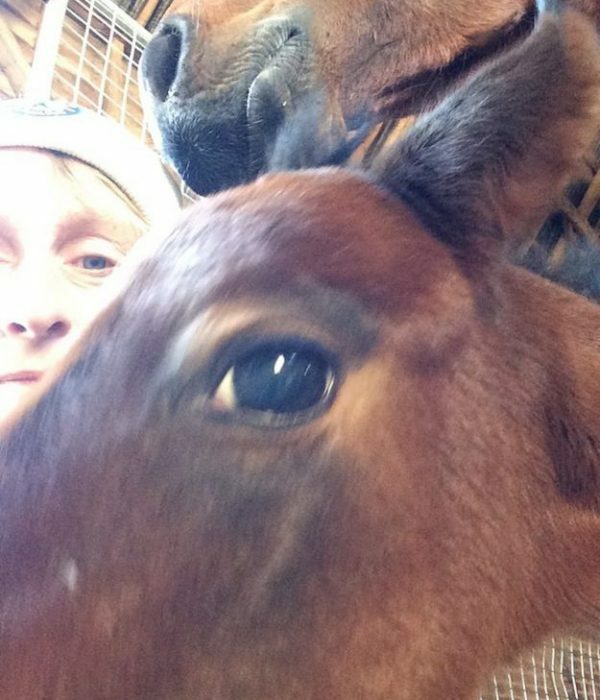 We don’t have a photo of COTUBANAMA from Sunday although Janet Evans at the stud has found a selfie of her from 2016…..
On Sunday we headed to a rain sodden Salisbury and it led to a treble at what, for both Mick Channon and Norman Court, is very much our local track. First up it was COTUBANAMA who won the juvenile fillies’ conditions stakes in partnership with Charlie Bishop as they took their time in the very heavy conditions to score by a length and three quarters, making the most of the experience the daughter of Heerat gained on debut at Newmarket a fortnight ago. She was third that day and the penny only dropped late on, finishing in eye-catching fashion. As owner, breeder and trainer, Mick was obviously delighted that she’s improved for the run. 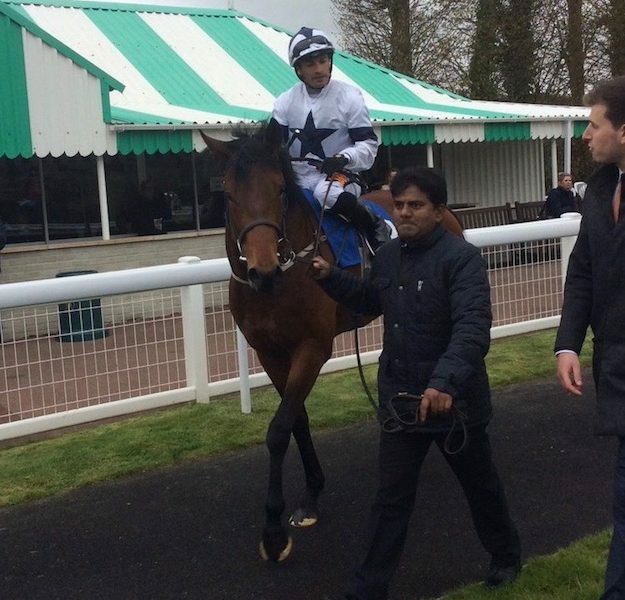 “This is one tough cookie and I’m delighted for Mickley Stud that Heerat is off the mark. We’ve got a few Heerats at Norman Court Stud, one is a smashing yearling out of a mare called Paaches who had plenty of boot but never fulfilled her potential because of injury. The dam of this one, Saona Island was very similar. She never even made it to the track but she didn’t half go well at home – luckily her daughter has boot too and she could be decent. COTUBANAME: first living foal; Saona Island, her dam is an unraced sister to 8.6f AW winner Bountiful Guest and closely related to 5f/5.7f winner Hot Pursuits, is granddaughter of 6f 2yo Listed winner Ivory Bride (dam of smart 5f-7f winner Funfair Wane). The second winner of the day was The Further Folly Partnership’s WESTBROOK BERTIE who broke his maiden at the fifth time of asking under Silvestre de Sousa in the Class 4 three year old handicap over a mile and a quarter. WESTBROOK BERTIE showed plenty of ability at two and was unlucky on occasions, not least at Brighton last October when he was brought down and splattered David Egan all across the downs, but that is now a distant memory as the son of Sixties Icon virtually made all in a trappy four runner contest, accounting for the warm favourite First Eleven into the bargain. Mick Channon was delighted. “Very pleased for the Parnership who enjoyed a lot of success with Opal Tiara and whilst WESTBROOK BERTIE may not reach her levels of success, he’s shown he can mix it with horses rated around the 80 mark so he’s no duffer. Silvestre gave him a very uncomplicated ride and he handled the ground. WESTBROOK BERTIE: 7th foal; full brother to winners Yorkshire Icon (7f-1m GB 2yo/US RPR 86) and Amahoro (5f 2yo; 84), half-brother to winners Selinda (6f 2yo; 56) and Alfraamsey (6f-2m inc at 2/AW; 75 and 2m hurdle/chase); His dam, EVANESCE 6f winner (72). Lastly and by no means least it was Patrick Trant’s BILLY RAY who took the third leg of the hat-trick in the Class 4 mile and a half maiden for three year olds. With Charlie Bishop up, the tactics were key in the heavy ground and whilst the field understandably tired in the closing stages, Charlie always looked confident in behind the leaders. Another Sixties Icon colt, although, as Mick Channon explains, BILLY RAY is in stark contrast to the precoscity of KINKS. “He was never going to be sharp but this is a real stunner of a horse. A proper horse with size, scope and a real presence about him. I gave him a couple of runs at two because mentally he was such a backward slob that I wanted to switch him on. “That did him no harm and he hit the ground running this year, finishing second at Wolves when I really didn’t know what to expect before proving that he could have a bright future after yesterday’s win. The following day’s success arrived in the form of CAN CAN SIXTY TWO who took the Class 6 mile and a quarter handicap under Callum Shepherd. It was an admirable effort in the heavy ground as CAN CAN SIXTY TWO was in front a long way from home on her first venture beyond a mile and she saw the trip out very nicely. Mick Channon, her Owner, Breeder and Trainer was more than happy. “She’s not a star but she’s out of an old mare of mine who has always given me a lot of joy and CAN CAN SIXTY TWO is a typical example. She’s a half sister to the likes of Fork Handles and Ingleby Mackenzie and I like her half sister CHYNNA who is by Gregorian and makes her second start tonight at Kempton. CAN CAN SIXTY TWO is the 10th foal and a full sister to winners Ingleby Mackenzie (11.8f; RPR 69) and Sojoum (Belgium 11.5f), a half-sister to 3 winners inc Fork Handles (6f 2yo/1m2f; 98) and Think (8.4f; 52); Her dam, NATALIE JAY was a 7f-1m winner (85) half-sister to 1m Listed winner You Know The Rules. So, were going very well on the track and now all we need to do is update all of the new arrivals at the stud….. Coming soon!